1. Make a few slashes in the middle of the fish and trim the tail and the fins. 2. Layer a baking dish with half onions, garlic and tomatoes. 3. Keeping the fish on the top, insert the bacon in the cuts. 4. Now, cover the top with the remaining garlic, onions and tomatoes. Place the potatoes at the side and season with salt and pepper. 5. Next, sprinkle the olive oil and the white wine and then add the sweet chillies. 6. Finally garnish with the parsley leaves and bake in a pre-heated oven for approximately 40 minutes. 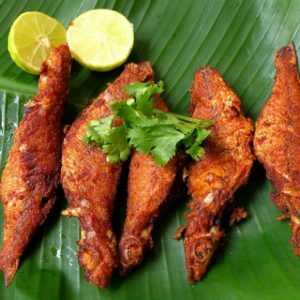 Feel free to comment or share your thoughts on this Whole Fish Recipe from Awesome Cuisine.